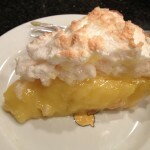 This is probably the BEST lemon meringue pie I have ever had. 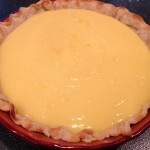 Yum scrum 🙂 It’s best served the day it’s made, but you can make the filling in advance, and refrigerate 2 days, then put the pie together..
1) For the filling: Whisk together eggs, egg yolks, and sugar until pale yellow, about 2 minutes. Add cornstarch and salt and continue whisking until well combined. Add lemon juice, water, lemon zest and butter. Continue whisking until fully incorporated. 2) Pour into a heavy saucepan and place over medium heat. Whisk continuously, scraping sides with a spatula and taking care not to burn the bottom. Make sure you whisk constantly. It will burn very easily. Cook until thickened – about 7-8 minutes. Remove from heat and continue whisking one more minute. 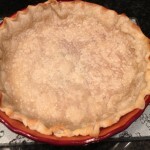 3) Pour into prebaked pie crust. Cover pie with plastic wrap and refrigerate at least one hour. 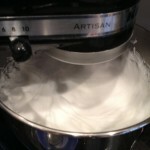 4) For meringue: Beat egg whites with an electric mixer on high speed until foamy. 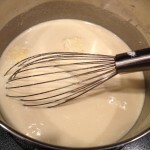 Add cream of tartar and salt and continue mixing until soft peaks form. Slowly add sugar, 1 tablespoon at a time, beating well after each addition. Add vanilla and beat 30 more seconds. 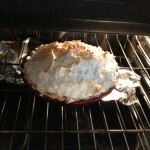 Place meringue on top of lemon filling in the pie crust. It is easier to mound up in the middle and then spread to the sides. 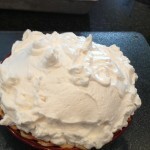 Smooth with rubber scraper to cover the entire pie and leave a mound in the middle, forming peaks. 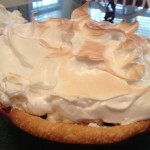 This entry was posted in Pie and tagged lemon, lemon meringue pie. Bookmark the permalink. My absolute favorite when I was a kid. I’ve still not tried making it myself yet. Your looks great!